I’m a huge animal lover and a big believer in how the power of spending time with pets and other creatures can make a world of difference to mental health. As such, as I read the new title from EK Books, Finn and Puss, the content lured me in straight away. 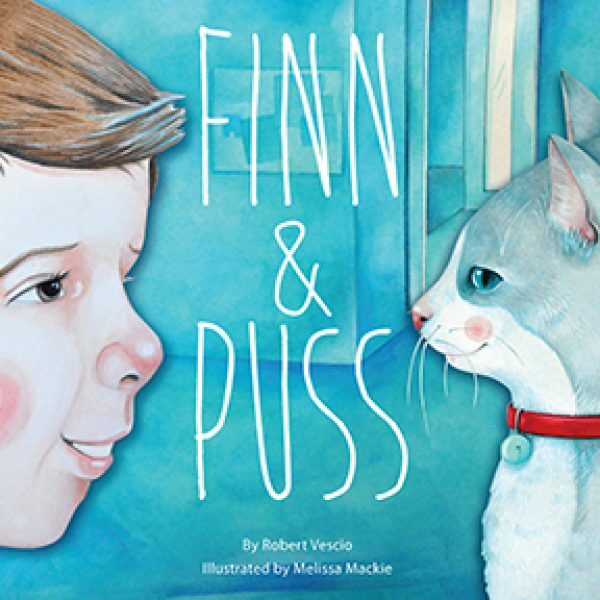 In the story, written by Robert Vescio and illustrated by Melissa Mackie, a young boy, Finn, is lonely until he meets a lost cat named Puss. The pair bond and all seems well until Finn sees a ‘Lost’ poster, and is faced with a difficult decision – should he reunite his new friend with its owner, or keep the cat all to himself? We all know that when they’re young and learning about the world and themselves, children (and even adults! ), often struggle choosing between right and wrong when conflicting ideas and desires arise. In Finn and Puss, the author has found a clever way to highlight this struggle without being didactic. The book also deals with themes of loneliness, friendship (human and animal) and comfort. The words in Finn and Puss are limited, as tends to be Robert Vescio’s way. In turn, this allows the illustrations to convey a lot of emotion and meaning, plus it give kids a chance to think about what they would do in the same situation. The book should make for a wonderful ethics and compassion discussion prompt for parents, teachers and librarians. The illustrations by Melissa Mackie complement the story perfectly. The pictures use a soft colour palette of mostly greys, blues, reds and whites, and plenty of clear space is left on many of the pages to continue the sparse yet emotive feel. I particularly love the front cover of the book, where we see an up-close image of Finn and Puss on either side of the title, looking at each other. This immediately conveys a sense of love and connection. The book is available online and in bookstores now. Recommended for children aged around three years and up. Please note: the publisher provided a complimentary copy of this picture book in exchange for an honest review. I recently had the chance to chat with author Robert Vescio about his work, creative process, influences and more. Click here to read the interview.